You may know him as contributing editor for Threads magazine, or FIT instructor, or better yet from his gorgeous courtier designs. It's Kenneth D. King!! Ryliss of Sewing & Design School brought Kenneth to Tacoma to teach us how to draft our moulage and sleeve as she believes he is the best drafter in the business. What a treat! Kenneth explaining the process of creating princess seams. Photo courtesy of Ryliss Bod. The entry to Opera Alley, where you enter Sewing & Design School. Photo by Gwen Gyldenege (c) 2013. All rights reserved. I decided to take the class not only to augment the dress form I made in Jan Bones class, but also because I do enjoy drafting and I rarely have had or made the opportunity to draft save for in creating my own sewing patterns. You see, by the time I entered my first career field, Mechanical Engineering, it's drafting was all done entirely on a computer through a CAD program or in some other program to create parts on 3-D printer. The paper, rulers and pencils went to the wayside for ME's, but we didn't let those awesome drafting tables go to waste - In our study room, we used the drafting tables for doing our homework and creating fond memories of silliness. Years ago, I drafted skirt patterns with Cecilia Podolak (a simply lovely lady and instructor) at Haberman's Fabrics (A MUST go visit!). It was fun and I wanted more, but haven't drafted since. So, when Kenneth's class came up in Tacoma, I was determined to attend. I even sold off a bunch of my coveted club and hard-to-find fiber & yarn stash to pay for the class. Now that's dedication! And it was worth it. Showing off my dingleball bouquet over my sleeve draft in the 2013 moulage and sleeve class at Tacoma Sewing & Design School. Photo by Gwen Gyldenege. Copyright (c) 2013. All Rights Reserved. The top of the sleeve draft. Photo by Gwen Gyldenege. Copyright (c) 2013. All Rights Reserved. The drafting tools we used in the 2013 moulage and sleeve class at Tacoma Sewing & Design School. Photo by Gwen Gyldenege. Copyright (c) 2013. All Rights Reserved. Dingleballs and sleeves. Wouldn't those be fun along a seam? My sleeve draft in the 2013 moulage and sleeve class at Tacoma Sewing & Design School. Photo by Gwen Gyldenege. Copyright (c) 2013. All Rights Reserved. Part of the class was hard because I haven't been feeling well. So, naturally I was hard on myself, shy, and wanted to hide. Yes, I was shy. It happens more than you'd realize. And the other parts of the class, the people, Kenneth, the finished moulage, were very fun. I met amazing people and made fast friends with several in the class. What a pleasure to be around such sharp and interested sewing minds. The 2013 Moulage class is hard at Work. I'm right in the middle with my African Inspired skirt. Photo Courtesy of Ryliss Bod, Tacoma Sewing & Design School. Kenneth explains drafting the front of the moulage. 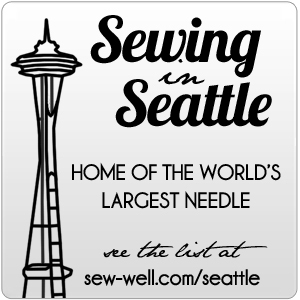 Photo courtesy of Ryliss Bod, Tacoma Sewing & Design School. We also had time to get to know Kenneth at a dinner one evening and between bits in classes. Quite a funny man. He has loads of entertaining stories and loves to chat with his students while helping them learn. It made the 4 consecutive days of class fun and go by quickly. Kenneth & Leah posing. Photo courtesy of Ryliss Bod, Tacoma Sewing & Design School. Shortly after our class, Kenneth was awarded the Association of Sewing and Design Professionals' (ASDP) 2013 Lifetime Achievement Award. Congratulations Kenneth! You are most deserving!! Thank you for continuing to share your gifts and talents.